EUM REPELLE! PER PORTAM PELLE! PUSH HIM BACK! GET HIM BACK THROUGH THE GATE! In terms of Patreon news, this month’s Flashback Friday is very special. 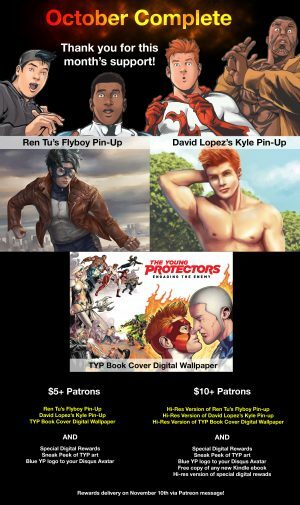 It’s a digital wallpaper based on the cover of Volume One of The Young Protectors! This is actually one of our most popular wallpapers. Tons of readers come up to me at Cons and let me know this is the wallpaper they are using for their desktop. And if you become a $5+ Patron, you can download that wallpaper immediately. And $10+ Patrons will be sent a high-res version of that wallpaper with over double the resolution on November 10th! So! The team has engaged their fiercest enemy yet—the great King of Hell, Laampros! Will they be able to push him back through the Gate? Or will he exact a terrible price for their insolence?